Apparently there’s nothing like a national championship to make you want to tie the knot. Because that’s where Matt Montgomery, 30, asked the now Melissa Montgomery, 27, to marry him—at the BCS National Championship Game. And that’s where she said yes. 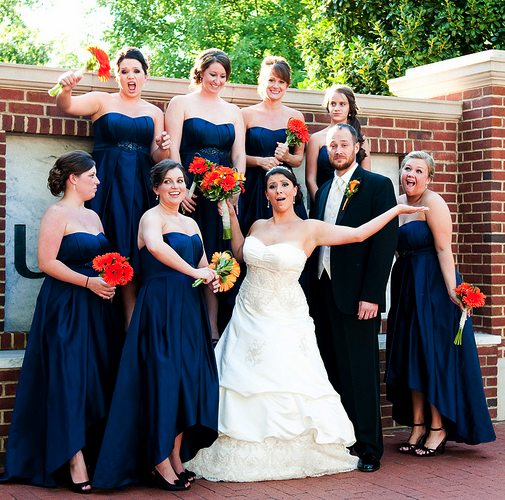 Eight months later they became the first couple to say “I Do” in front of Samford Hall. Auburn University only recent offered the use of Samford Hall for weddings thanks to a record number of requests from betrothed Tiger fans since January 10. The Auburn couple—he works at the university, she does web design for Big Blue Bookstore—walked down the aisle in style. Melisa wore navy blue shoes. She carried orange flowers. The bridesmaids were in blue. The groomsmen wore orange vests. The wedding guests were given Auburn shakers to wave as Matt kissed his bride. And the first song they heard as man and wife? The Auburn fight song. Check out the OA-News story on the War Eagle wedding here. Photo via Fotoscape Photography / Vesko Ruychev. Not to be that guy, but lots of typos here. Otherwise, really cool. Ultimate Auburn themed wedding. Thanks, Wes — some weird HTML issues started pushing stuff together, didn’t correct them, at least not enough. Let us know if you see any else. Where is the honeymoon? Conference center? I would secretly make fun of Bama fans for doing this but it’s a total double standard because I think it looks great for this crew to do it.